Thornedike, ME: G.K. Hall, 1993. 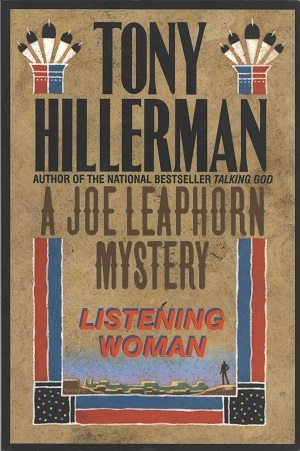 Publisher G.K. Hall came out with both a hard- and paperback large-print edition of Tony Hillerman's 1978 novel Listening Woman in 1993. Both the hardback's dust jacket and the paperback's covers are the same. These 1993 covers also replicate G.K. Hall's 1989 editions of the novel, which were designed and copyrighted by Hillerman's long-time graphic collaborator Peter Thorpe. Binding: Paper boards with full color design that replicates the dustjacket of the hardback edition. Spine repeats color scheme of front cover, while listing title, secondary title, and author's name. The publisher's device is imprinted vertically at the bottom of the spine. The back cover lists reviews, a summary of the novel, and a brief biography of the author.